Torzhok is situated 240 km away from Moscow, on the federal highway from Moscow to St. Petersburg, and for this reason the best way to get there is by car; if you go there by bus or train, you will have to transfer in Tver. You can see all of Torzhok in one day, and return to Moscow, or spend the whole weekend there. Torzhok was established in the 9th century and has always been a node where commercial routes intersect. This contributed to its economic growth, and this is why it is still a beautiful place today. This is where you will find the oldest Orthodox monastery in Russia and the oldest extant wooden church. The heyday of Torzhok came in the first decades of the 19th century, when this provincial town and its suburbs were built up in a style worthy of a capital city by the architect N. A. Lvov, who has been called “the Russian Leonardo”. Torzhok locals all agree that Torzhok has the worst roads in all of Russia. The roads here are reminiscent of an artillery range peppered with craters. The traffic and street planning is also incredibly unpredictable, one-way streets being the norm. -Near the town entrance you will find the exhibit hall of the “Torzhok Gold Wire Embroiderers” factory (www.zolotoshveya.com), at the address 12, Kalininskoe Shosse. Torzhok is the only town in Russia and in the world, where the craft of gold-wire embroidery is still alive, and where Russian national symbols (flags, coats of arms, and military insignia) are embroidered by hand. You can visit a master class and learn how to embroider a golden wallet for yourself. -The ruins of the Pozharsky Inn, which burnt down in 2002 at 48 Dzerzhinsky St. Luminaries of culture such as Pushkin, Zhukovsky, Aksakov, Gogol, and Turgenev spent time at this inn in the 19th century. You may begin your exploration of the town from the square right by the inn. The signature dish of the local restaurant – Pozharsky's cutlets – have even been mentioned by Pushkin in his poetry, and the hero of Pushkin's famous novel “Eugene Onegin” is named after the man who owned the local bakery at the time. We recommend ordering Pozharsky's cutlets at Yurves Cafe, at 34 Mira St., not far from the Torzhok Gold Wire Embroiderers. The dish is named after the owners of the inn (which subsequently was rebuilt into a hotel). In one version, the recipe for the cutlets was given to Darya Pozharskaya by a poor Frenchman as payment for his room. In another version, the recipe was made up by Darya herself. Now, this is the best known recipe for cutlets in Russia. - The “Don Juan list” of Alexander Pushkin and his answers to the inquiries he had to face for writing politically provocative poetry can be seen nearby, at the Alexander Pushkin Museum, at 71 Dzerzhinsky St. Pushkin visited Torzhok 20 times during his life. Be sure to ask for a guided tour at the museum – it's sure to be fascinating. - Go down to the river. From the bridge over Tvertsa you have beautiful views of the river and the monasteries of Torzhok. Here is where you will find the Rotonda, built in 1783 with the Roman Pantheon as a model. - Past the bridge and the square turn right, onto the side streets off Lunacharsky St. Here, in the run down building of the former church at no. 13, they sell the best pies in the world! - Also here, on Lunacharsky St. at no. 21, you will find the local ethnographic museum. The museum curators are not very friendly, but the original design of the building is by itself worth exploring. 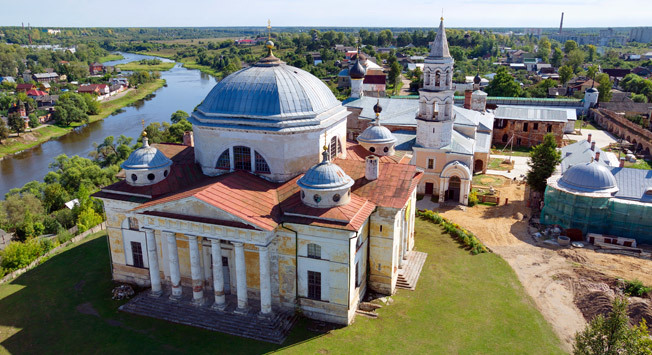 - Going back to the central square and walking down the Tvertsa river bank, through the grass-covered hills, you will arrive at the Boris and Gleb monastery. This is the third oldest monastery since the monastic tradition began in Russia. It was founded in 1038 by the nobleman Ephrem, almost at the same time as the Kiev-Pechersk monastery. According to the legend, Ephrem requested in his last will that he be buried together with the head of his deceased brother Georgi, which he had kept hidden until his death. In 1919 operatives of the People's Commissariat opened the grave, found in it an “extra” head, and made a report. In the monastery compound, there are several unique churches. From 1925, the monastery functioned as a penitentiary, and now it is slowly being restored to its original shape. From the monastery hills you have one of the best views of an antique Russian town that you will ever encounter. - On your way out of the monastery, the banners will try to persuade you to take a tour of the interactive exhibit “The New Torzhok Fort”. The entrance is just 50 roubles ($1.3) – but even at this price there is not much worth doing there, except maybe shooting a bow. -The Old Assumption Church (or Tikhvinskaya), a wooden church at 7 Gruzinskaya St., is the oldest of the wooden churches that are still standing. It was built without using a single metal nail, in the 16th-17th centuries. - If you take the road toward the Nikolskoe village, after 12 kilometers you arrive at the Pyatnitsa-Plot country estate. This was the residence of a scientist and artillerist, the founder of the Russian school of ballistic science, Nikolai Mayevsky. It's worth the trip, because you can also see the Smolenskaya church, a relic from 1790, and the tomb of the scientist, the fence of which is built entirely out of artillery shells. - Also, 12 km outside Torzhok, you can find the famous Poltoratsky family country estate, in the village of Gruziny. It is in disrepair, but is close enough to the road and can be visited for the price of an easy, short detour. - In the village of Prutnya, just 6 km outside of Torzhok, you can visit the grave of Anna Kern, the woman to whom Pushkin dedicated his famous poem Ja pomnju chudnoe mgnovenie “I remember that wonderful moment”. At the bifurcation, turn right. - If you turn left at the bifurcation, you will find the Vasilevo Open Air Museum of Wood Architecture, which lately has become quite popular. The gem of this park is the 100 meter long “Devil's Bridge”, built of stone without any metal or concrete, in the shape of an archivolt. The stones are held together only by virtue of their arrangement. How this was possible to accomplish, more than one hundred years ago, remains an enigma to this day. For many visitors, this bridge remains the main attraction of Vasilevo and even the Torzhok area in general. According to one of the legends, the “Devil's bridge” gets its name from the giant boulders that surround it, which number exactly 13. According to a different story, the architect of the bridge was inspired to build it where the armies of Alexander Suvorov marched over the Alps and in the location of their attack on the “Devil's bridge”. -The Znamenskoe-Raek country estate, a monument of 18th century architecture, was built as a retreat and guest house for members of the Imperial family, and is located 20 km away from Torzhok in the direction of Tver. Nowadays this country estate is one of the most famous in Russia. Tourist facilities are available right on the estate. However, a luxury suite for two costs about 7000 roubles ($ 200) per night.